The news can be an odd phenomenon – for many of us it is a 24-hour, all-pervasive obsession. We pick up stories from all over the world and practically spontaneously begin to comment on them. In some countries our ability to openly discuss any subject we wish on the planet is a great freedom, even a luxury. But I suppose what disappoints many of us is the nature of the beast it self: the unfortunate fact that bad news travels so much faster than good news. To our shame we seem to have a distasteful appetite for the horror and conflict in the news. We can’t blame our journalists for feeding us the platter we have ordered. We can’t even blame our politicians if they sound lame or scandalous. We elected them. We have even elected the reality TV celebrities we love to hate. May the entire universe be blessed with peace and hope. May everyone driven by envy and enmity become pacified and reconciled. May all living beings develop a biding concern for the welfare of others. May our own hearts and minds be filled with purity and serenity. May all these blessings flow naturally from this supreme benediction: May our attention become detached from the mundane and absorbed in the rapture of pure love of God. Hare Krishna. BBC Radio 4 commissioned me to broadcast six prayers in their ‘Prayer for the Day’ slot. The first was broadcast on BBC Radio 4 today, Gaura Purnima. I will post the others as they are aired. 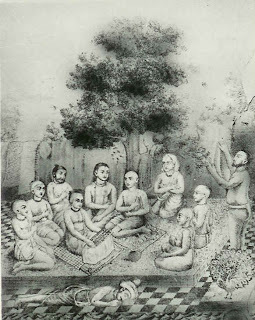 Today in England small groups of Hindus, from the Vaishnava persuasion, gather together to celebrate the saint Shri Chaitanya, who lived in India 500 years ago. Shri Chaitanya is renowned for his beautiful chanting of the names of God, and his inspiring personal example of humility. There’s something about humility. Once you claim to have it you’ve lost it. Yet, it’s such a universal principle, appreciated by every culture in the world. And we all have our humbling experiences. I have one that happened on live TV news. The interview was going very well. There was a touch of the combative about it. One of those, “Where was God during the tsunami?” interviews. Questions coming thick and fast but I was ready for all angles, on top of my game. Yes, I was as proud as a peacock. Then one of my front teeth, a crown – that has stayed religiously in place for 25 years – fell out in mid-theological flow. There I was defending God, in all my righteousness, only to be reminded that my pride is as false as my front tooth. I survived to tell the tale – we usually do. But if we can honestly reflect on these experiences we will find them most instructive. They will help mould good character and nurture wisdom. ….serve God in a humble state of mind, thinking ourselves lower than the straw in the street… more tolerant than a tree… ready to offer all respect to others and expect none for ourselves. In such a state of mind we can serve the Lord, and chant his name constantly. Hare Krishna.